- Dr. Koyzis but an HRH in front of my name on his blog site and I just noticed. - This weekend I went to see Bedouin Soundclash, an inspiring reggae-tinged band. - Their audience, made up primarily of inebriated first-year university students, was rather uninspiring. - When you can formulate the following sentence you need to ask yourself whether ESL is really necessary for you: The woman had difficulty obtaining a job due to the rather large carnivorous appendage growing from her forehead. - On Sunday I drag-raced a gas truck during a snow storm and it crashed and exploded in a ball of fire. - The previous statement was inspired by James Frey's memoir and represents my personal and emotional truth. I did pass a gas truck on the highway during a snow storm but it didn't actually crash, although he might have pulled over because the weather was rather horrid. - Perhaps I was too hard on Nickelback, after all there is a lot of music out there that is far far worse. - I'm looking at you, Mr. Masari. - When you have an HRH in front of your name you have a certain sense of entitlement. - I visited Rideau Hall on Friday and was astounded at how small it was originally under the ownership of Thomas Mckay. Too bad I couldn't find a picture. - One of my students pointed out that his house was taller than the South African embassy. - The South African embassy is pretty darn tall. - Apparently it helps sales when Osama bin Laden recommends your book, but I'm sure it does little for your reputation. - Of course a lot of Americans would stop eating bow-tie pasta if they found out that it was Osama's favourite. - Bow-tie pasta, of course, is fairly benign in comparison to something which communicates ideas. - Still, Osama often highjacks legitimate criticisms of American policy and mixes them into his volatile ideology. - Read a classic short story on the web sometime. - A social and moral conscience is not the exclusive domain of those who are considered "right-wing", nor is equality, social justice, and international cooperation the exclusive domain of those who are considered "left-wing." - When I was young I thought the Quaker icon on Harvest Crunch was a jolly old fat woman. - I astonished to learn that Romeo LeBlanc removed the claws and to ngue from the flag of the governor general of Canada. Why? Too scary, I guess. - Does this picture scare you? See how menacingly he brandishes that maple leaf? - Adrienne Clarkson had the neutering reversed. - At the age of eight or nine I came to the sudden realization that the quaker was a man and that he had, no doubt, helped Aunt Jemima and Uncle Ben escape from Col. Sanders. - Actually, Col. Sanders wasn't part of the equation. - Last Friday, I hurled a large boulder of ice and snow into the water just above Rideau Falls with the help of a Chinese tourist and an enthusiastic eleven-year-old ESL student. - I'm not certain that boulder hurling is an appropriate activity for a professional. - Michaëlle Jean was home when I went to Rideau Hall, but I didn't see her. 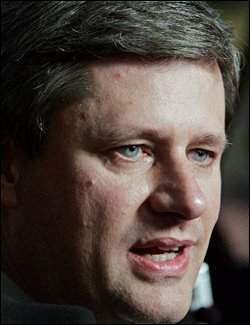 - When Stephen Harper tells off the American ambassador is that anti-Americanism? I don't know because apparently Conservatives are opposed to that sort of thing. - Actually, he made me rather proud with his mature and dignified response which can be contrasted favourably with Paul Martin's wild posturing over Kyoto (I agree with his supposed stance but not his approach). - I cannot believe that PETA activists compare themselves with civil rights workers. - Ndagu Kunda cane, Laurianne. Very good, graph rhymes with laugh. Maybe you can describe the picture a little more because I don't understand how red-eye can be construed as humorous. If poor photography strikes you as funny, you should see Miss Weston's grade four class' photography contest which would undoubtedly be a veritable gold mine of humour for you. And that thing on Joey's head? That's called a mullet, the legacy of your generation. Unfortunately, up only rhymes with up because they are the same word which, technically, means that they don't actually rhyme. The verse begins on the subject of the house and ends on the subject of the house but the third line suddenly inserts this random thought: "I never knew we'd ever went without." I suppose you can connect your home to your socio-economic status, but from the music video the house looks pretty nice. I mean, even if it was in a fairly poor state before the present owner fixed it up we're still talking about a nice two-story middle-class home. Maybe you didn't receive all of the flashy electronic gifts your friends got for Christmas but your parents cared enough about you to make it difficult for you to sneak out of your home at night. School and do don't rhyme but they do have assonance, which I suppose is more acceptable than trying to rhyme up with up. What did you have to do that was more important than going to school? Maybe you can fill us in on this later, what's more important now is that you broke into your school. The idea that you broke into your school a half a dozen times doesn't blend well with the idea that you ostensibly had better things to do than go to school. Apparently, you were so desperate for school that you broke into school during your spare time. Not only that, but you were so bad at breaking into your school that you were caught one third of the time. It is never too late to graduate, Chad, or to take some remedial English courses. So life's better now than it was back then? I'll assume you're speaking economically because the whole song consists of you waxing poetic on how many great memories you have of growing up. So here you go again, complaining about your socio-economic problems when it is clear from a latter section of the song that you at least had access to a vehicle as a youngster which makes the whole complaint about how bad things were back then fall kind of flat. I wouldn't worry about them not letting you into school, because I'm sure that you have earned enough money off of your heavy petal music to hire a tutor. God? What does he have to do with it? Nothing? Oh, okay, you just thought it sounded kind of cool to invoke his name? Oh, I see now. "Every memory of looking out the back door" and "every memory of walking out the front door" are sentence fragments which I'll forgive if you explain to me whether you're saying goodbye to your friends, your memories, your photo album, or the photo of the friend that you were looking for. Are you contemplating suicide? I contemplate radiocide everytime I hear this song. I usually just turn it off, though, because I'm not a violent person. Let me see if I understand this correctly, because earlier you said that you didn't go to school because most of the time you had better things to do. Basically, you're saying that playing pong or pinball was more important than going to school? I can understand that it was more fun to do that a couple times a month but if you did that most of the time it would get pretty lame after a while. Also, I don't know which town in Alberta has an arcade where the cool kids hang out, but here in Ontario we have this stigma attached to arcades where it is, you know, sort of a place for the geeky types --- not that there is anything wrong with being a geek. I find it difficult to picture the cops coming down hard on arcade nerds, but maybe you have a photograph of this that can help me out here. I should also add that when you follow the line about the cops hating you for hanging out at the arcade with a line about somebody burning it down it seems to imply that the police had a hand in the arson. Okay, I'm being facetious, but it's kind of fun. Radio and know do rhyme, but since you're talking about something that occurred in the past, know should be knew which, incidentally, doesn't rhyme with radio. Hey, wow, you found out how it feels to sing to more than just a steering wheel! How does it feel? Because for me it's pretty torturous and it makes me wish that you were once again serenading inanimate objects. I can relate to nearly missing on the first kiss so I can't actually make fun of that. Although, I suppose those who preach abstinence could reference your song when talking about the slippery slide of intimacy. I mean, Kim kissed you, and now look where she is, with two kids in the middle of who-knows-where. Ladies, take note, you need to resist the urge to kiss arcade geeks until after you're married to them. If you miss the town, why is it so hard to stay while at the same time being too hard to leave? I can't believe it either. What would never change? Your educational abandonment? The arcade arson? Joey's mullet? I know that you repeat the chorus at this point but there's nothing in there that you could possibly be referring to. Also, I don't like your goatee. When I was young, I knew that my parents had all the answers. As I grew, I began to suspect that the answers lay in books. By the age of twelve I had all of the answers. Time passed and I soon learned that most of my answers were flawed and so I strove to re-educate myself on the answers. In University I learned to deconstruct answers and became quite adept at scoffing at other people's answers. Now, I continue to look for answers, but cling to the one my parents taught me from the beginning. "Congressman Barr and I have disagreed many times over the years, but we have joined together today with thousands of our fellow citizens-Democrats and Republicans alike-to express our shared concern that America's Constitution is in grave danger. As Dr. King once said, "Perhaps a new spirit is rising among us. If it is, let us trace its movements and pray that our own inner being may be sensitive to its guidance, for we are deeply in need of a new way beyond the darkness that seems so close around us."" Al Gore, Jan. 16, 2006. Constitution Hall, Washington, D.C. There was nothing in the employee handbook about this. He knew, because he had checked three times, each time looking under a different subject heading. There was absolutely nothing relating to swashbucklers, buccaneers, or corsairs, although there was a brief section on pirated software. Mr. Wentworth had read that section eagerly, but had learned nothing about actual pirates and a whole lot about copyright laws. Mr. Wentworth put a long thin index finger to his temple, and tapped his head nervously. Finally, after two minutes of deep thought he picked up his phone and anxiously dialed a number. "Yes, hello? Well, actually it's a bit of an emergency, but I'll hold if I must," Mr. Wentworth poked his head apprehensively half-way over the edge of his cubicle. "Gaarrrrrrr!" a raucous voice yelled from across the office. Fearfully, Mr. Wentworth hunkered down behind his desk. After what seemed like hours to Mr. Wentworth, but was actually about two minutes and thirty-three seconds he had an opportunity to speak. "Y-yes, I'm in a rather unique situation here," Mr. Wentworth spoke tremuously, "am I on the employee hotline?" "Oh, I don't care all that much about confidentiality at this present moment. I'm a little more concerned about my cubicle being pillaged by bloodthirsty pirates." Mr. Wentworth twittered nervously, "Yes, that's right, pirates." "No-no ma'am I am most certainly not trying to waste your time, there are actually pirates pillaging my office at this moment," Mr. Wentworth paused as an angry voice harangued him from the telephone receiver, "I assure you, I'm not whispering to avoid my coworkers hearing me, I'm whispering to avoid a cutlass in my jugular." "A cutlass? It's a short sword with a curved blade which was . . ." a Compaq monitor flew over top of Mr. Wentworth's cubicle and crashed into the wall beside his head," . . . used by sailors and pirates during the seventeenth century." "Well, yes I'm quite aware that the seventeenth century ended over three hundred years ago but there are indeed pirates in my office right now," Mr. Wentworth hissed, "and they are using cutlasses." "A falchion? Well they might be using those too," Mr. Wentworth continued, his voice shaking, "whether they're using a falchion or a cutlass or a sabre they all fall into the category of sharp metal objects which are notoriously dangerous when waved about by drunken privateers." "No ma'am, I'm most certainly not trying to give you lip, as you say. You will have to forgive my manners right now as it is difficult to be courteous when a band of pirates is marauding your office." "The police? Well, yes of course I considered calling them but the employee handbook explicitly states that emergency numbers should only be dialed in case of fire or an accident. As for violent situations, only senior staff have the authority to call the police in such a case and I'm afraid all of the senior staff have been taken as galley slaves." "No ma'am, I didn't realize that my employee handbook is in direct contravention of the law. But as I said before, all of the senior staff have been taken as galley slaves." "I really don't know where they parked their galley but if I had to venture a guess I would say that they parked it near the canal --- our office is directly adjacent to it, as you know," Mr. Wentworth cowered as a bottle of rum soared over his head and smashed into the wall not far from where the computer monitor had struck a moment earlier. "Well, yes, obviously it's a smaller boat; more of a sloop than an aircraft carrier," Mr. Wentworth chuckled despite himself, "Oh, no ma'am, I'm not laughing at you, I just found my earlier statement humourous." "See an aircraft carrier is so large and a sloop is so small I found the juxtaposition to be amusing." "Yes-yes I realize that it should be difficult to laugh during a pirate invasion, but you have to understand that sometimes humour is the best medicine during a particularly stressful time in your life," Mr. Wentworth was thumbing through the employee handbook for an entry under privateer, "No, I really don't need a psychologist, what I need is some advice on dealing with marauding pirates." There were some entries on employee privacy in the handbook, but nothing on privateers, "if you could search the regulations for the standard response to such a situation I would be most grateful." "To be perfectly honest, ma'am, the only person whose time has been wasted is myself if you hang up now as you say you are going to," Mr. Wentworth growled with something approaching anger in his voice, "Now please tell me what I must do . . . Why are you laughing?" "Yes, I did say it was good medicine for stressful situations but I think you'll agree that the stress you're under pales in comparison to my current level of pirate-induced stress," Mr. Wentworth's gangily fist tightened angrily as he pounded the air furiously. "Robert Louis Stevenson?" Mr. Wentworth queried, his anger subsiding slightly. "I'm afraid I don't have time to read an entire novel and I'm certain that his novel would not offer any solution to my current problem as it was written long before the era of photocopiers and faxes, thank you very much." "Yes, you're quite right, photocopying and faxing won't thwart a band of marauding buccaneers, but I'm sure you understand what I meant. You see, it's ridiculous to think that a nineteenth century author could offer a solution to a twenty-first century office being invaded by seventeenth century pirates." "He wrote fiction, ma'am, and I have no time for that in this real life-threatening situation that I find myself facing at this present moment." "Yes ma'am, I understand that you find my account fairly close to fiction and I would too if I were in your situation," Mr. Wentworth gave a ragged sigh, "so, please ma'am, can you offer a solution? That is what they pay you for, isn't it?" "I apologize, I shouldn't have said that." "Well yes, it was more of a sarcastic question than a statement and, yes, I should have used the word asked instead of said; but I don't think think this is the time for grammatical nitpicking," Mr. Wentworth nodded impatiently, as if unaware that his gesture would remain unrecorded by the device in his hand. A barrel of what Mr. Wentworth assumed to be rum rolled down the aisle and past his cubicle before slamming into a photocopier. "That noise? A barrel of rum which rolled into a photocopier, that's all," Mr. Wentworth bit his lip nervously. "Oh? You have some advice?" Mr. Wentworth listened carefully and then nodded. He carefully hung up the phone and slid onto his haunches under his desk. After all, he decided, what could one do during a pirate invasion but hide under one's desk? One of my hobbies, and I don't have many of them, is to go to Amazon.com. Now, I'm certain that most people go to Amazon.com to shop for books, music, DVD's, shoes and other such items. I suppose it's possible to have the rare individual who, while looking for a mythical one-breasted tribe of female archers, mistakenly stumbles upon the amazon.com website. Of course, an individual who was this nerdy and didn't know what amazon.com was would be a contradiction in terms and would likely be sucked into some kind of vortex created by his or her own self discrepancy. These individuals are therefore a non-issue and will not be dealt with any further. As for me, I go to Amazon.com to infuriate myself. I take it by your shocked silence that I have completely baffled you. Why, you ask, would someone purposely infuriate themselves and, how, you ask further, would one go about doing this on Amazon.com? ""Sit Down! (Siddown!) Shut Up! It's not about your rights. Sit Down! (Siddown!) Shut Up! And so on, through song after song -- a lot of preachy Caribbean whining and racial aggression by the most self-righteous of all reggae "artists." One only wishes that Marley had made it into Oxford (he tried, but affirmative action programs were not what they are today and he was quickly eliminated from the pool) in order to learn the Queen's English. ("Dem sho big words, mon!") Some of his music is faintly catchy, in its own way, but one only wishes that Marley had teamed up with an intelligent lyricist -- maybe V.S. Naipaul, the bard of "third world nations," could have said something useful about Jamaica. Anybody who listens to Marley after graduating college (where you have to pay tribute to this insipid sort of mult-cult) is either self-loathing or grandiose. As one of the other reviewers put it here, Jamaica's best musician remains Noel Coward, even if he didn't start off there. (And how depressed he would be by the cesspool the once-lovely island has become, in large part due to the "liberation" spawned by Marley's addlepated followers!)" Grrrrrrr (this is me getting angry). Now why did I do that to myself? I don't know, maybe because I'm a grandiose self-loathing graduate of a college? I guess the best answer is that I kind of have a sick fascination with reading opinions which I strongly disagree with. Try it. It's kind of fun. - The holidays have interrupted my blogging, and although today is supposed to be a holiday although it technically isn't, I'm back in the blogging world. - I have started to read the Art of War while on the toilet. There's a funny metaphor for this but I can't quite get it out. - I went to work today, there was only one student. - I used to find Usher annoying but then Chris Brown came around and I found out what that word really means. - Would you know my name if I saw you in heaven? - Samechlaus Beer is, how you say? . . . aaah, yes, disgusting. - It's time to put Marduk back into Solstice. - Oh, and bring back the ritual sacrifice of criminals posing as kings. - Next time you see Laurianne ask her for some butterscotch life savers. - Don't you hate inside jokes? - I don't, especially when I'm in on them. - I still laugh at inside jokes when I'm technically on the outside of them. - Maybe you can follow my lead here. - Happy New Year to all those people who follow the Gregorian Calendar. Shout out to all my homees using the Persian calendar and all the yutes on the Hebrew and Chinese calendars, but the Gregorian takes the cake. Big up Pope Gregory XIII, the reason for the season. - Would it be the same . . . if I saw you in heaven? - Samechlaus beer is 14% alcohol, and 16% syrup, and 70% Rhine water. - Angelo Ahmed Arifi, Marie-Ange is very much alive and well and living in Ottawa. She studies something or other at Carleton University and she's just as funny as ever. I'll tell her you said hey. - I should clarify that that whole thing about the Olympics (winter actually, not paralympics after all) was not original work by me. I copied it from somewhere else where they presumably copied it from somewhere else. - I apologize to all the people I didn't end up seeing over Christmas. We had a limited time in Hamilton and spent most of it with family where we were spoiled without mercy. - Some people call Hamilton "the Hammer." I lived in Hamilton for fifteen years before I heard it called this name. - My mother used to refer to "the mountain" as "the hill" and "downtown" as "the pit." - Our door in Gatineau is always open to visitors. Just warn us before you come because we're not very tidy. - Video Super Choix refused to exchange a scratched DVD or offer me a refund. In return, I am offering a thorough denunciation of their badly organized and competely mismanaged excuse for a Video Rental Outlet. - Don't worry, there was no loud verbal confrontation when they refused to exchange my DVD. I was a very polite Anglophone. - In "the Hammer" Laurianne almost got pulled over by a cop who thought she was missing her front plate. She never did get pulled over but he did turn on his lights and do a U-turn. Vive le Quebec! - Christmas dinner X 4 . . . it's a beautiful thing.